My goal in Horsemanship is to help you find a friendship with your horse--to help him to learn through teaching with the instinctional, natural language of the horse and not forcing him with gimmicks or pressure. As you learn more on how the horse thinks and moves, there is nothing the two of you can't achieve. With this method you can gain confidence and learn to prepare your horse for any situation or maneuver. This process will also give you a friend and partner that you can learn to learn together on the ground or on his back. 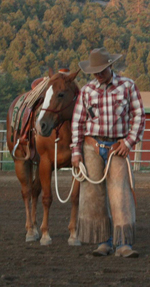 Paul is available for lessons, colt starting, training and clinics. Contact Paul Dietz to start a new relationship with your horse or to host a clinic! Also, on February 27-28, 2010, Paul Dietz was one of 21 colt-starting demonstrators at the Ray Hunt Memorial Clinic in Fort Worth, TX. To see pictures of Paul's presentation, click here!